Happy Valentine's Day! Here are some puzzles, crafts, and math worksheets for your class. Cut out the body, arms, and legs. Attach them together with brass paper fasteners. Color it in. It's a simple and fun Valentine's Day craft. Students cut and glue the pictures to make a Valentine's Day bingo board. Use candy hearts as markers for a fun February class game. Print out the heart-shaped game board. Then color pairs of adjacent numbers that add up to 14. The player with the most colored shapes wins. Cut out the letters in the word VALENTINE and rearrange them to make new words. 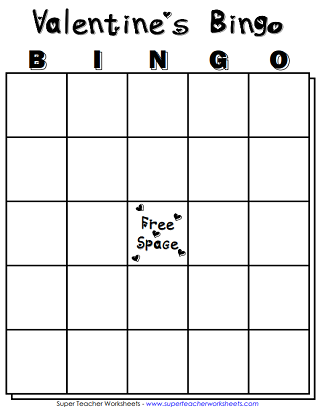 This activity includes primary-ruled lines for young students. Cut out the letters in the word VALENTINE and rearrange them to make 3, 4, and 5-letter words. This activity includes a scoring system and is designed for intermediate-level students. Crafty kids will enjoy making an adorable Valentine bear. Simply color, cut, and attach the head, body, and paws to a paper bag. Make a cute Valentine's Day crown with hearts on it. Kids can color it in, assemble it with tape, and wear it around the school. There are twenty Valentine words to unscramble in this printable worksheet. How many will your kids figure out? Can you find all of the Valentine's Day words hidden within the random letters of this word find puzzle? Use the symbol key at the top decode the puzzle to reveal the secret Valentine cryptogram message. Cut out the set of 25 word cards. Students rearrange the cards on their desks to make as many complete sentences as possible. They write each sentence on the primary-ruled paper. Word cards include a combination of Valentine's Day words and basic sight words. Cut out five word boxes. Rearrange the words and glue them onto the paper to make a complete sentence. The sentence reads, "Will you be my Valentine?" Emma has made valentines for her class. But on the way to school, she loses the one for her best friend. What will she do? Lauren's class is having a Valentine's Day party, but she seems to be the only one excited about it. That is until a special project brings out the secret valentines in everyone. When Amerie's teacher tells the class how a nineteen-year-old girl began the tradition of giving Valentine's cards, Amerie is determined to start a new tradition in her school. 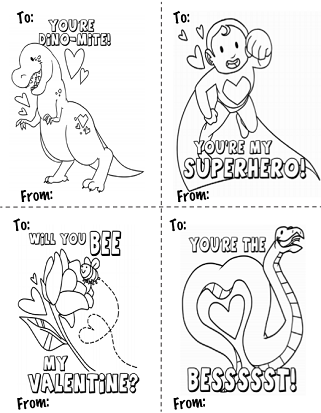 Color and cut out these 4 miniature Valentine;s Day cards on a single page. These are the prefect size for classroom Valentine exchanges. This full-page card says, "You're Dino-Mite!" Students can color the card and write a special message inside for a friend or family member. This full-page card reads, "You're My Superhero!" Students color the card and write a nice message inside for a family member or friend. This full-page card reads, "Will you BEE my Valentine?" Color the card and write a personal message inside. This full-page card has a picture of a snake and says, "You're the bessssst." Color the card and write a personal message inside. Place stickers on the Valentine hearts to keep track of students' reading assignments or completed homework. Find the answers to the the basic addition problems, then color according to the key. Add the 2-digit sums; Requires carrying ones; Valentine heart pictures. Subtract the problems to find the differences, then color according to the key. Subtract the two-digit numbers; Requires borrowing; Valentine heart pictures. 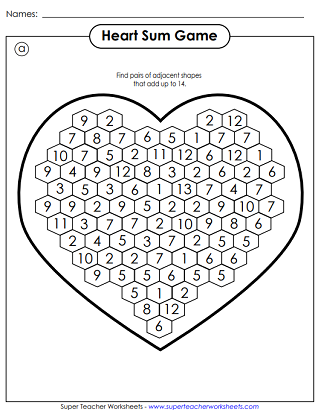 Multiply to find the products, then color the Valentine picture according to the color code at the bottom. Multiply the 2-digit numbers; Requires regrouping; Valentine heart pictures. Divide to find the quotients, then color the illustration according to the code at the bottom. Divide to find the answers to the simple division problems; Includes basic remainders. Color the numbers in the mystery picture according to the key. Learn about Washington and Lincoln with these printable Presidents' Day worksheets and activities. Print leprechaun crafts, puzzles, and math worksheets. Make your own custom puzzles, spelling worksheets, quizzes, bingo games, and math worksheets with our custom worksheet generator tools.